As the most ubiquitous protein found in blood, human albumin is seen at amounts of around 40 g/L. There are 585 amino acids of around 66.4 kDa in mass in this single chain protein, which also has a solid heart shaped structure along with 17 internal disulfide bridges . The purpose of albumin in blood is to perform as a cushion or a reserve for multiple minor substances such as toxins, fatty acids, hormones, and metals. Albumin transports these lesser entities from locations of high concentration to low concentration and vice versa. This is due to its common presence in the majority of tissues and chambers within the body, and its ability to easily flow between these locations. Further to this, albumin also makes up around 75% of the colloidal oncotic (or colloidal osmotic) blood pressure, and the single free cysteine of albumin (at position 34) contributes to the majority of reducing equivalents that can be seen in blood. The above characteristics make the use of albumin in stem cell therapies particularly useful. In the past, fetal bovine serum or crude human serum were used to obtain albumin in stem cell culture along with other materials. The discipline has, in recent years, moved towards using media made up of individually added proteins because of the need for more explicit, easily categorized and tactile media. In terms of the development of stem cells, this shift has not always been a desirable one; as some of the constituents present in serum that has been excluded once had a positive effect on the stem cells in question. As a solution to the replacement of serum, it was discovered that various growth enhancers needed to be added to the media for adequate functioning. While the use of bovine serum albumin for stem cell culture is still predominantly used in academic laboratories, the vast majority of industry tends to inhibit the use of cross-species media, and therefore use human albumin when requiring an albumin product to foster human stem cells. Despite this, the human serum albumin product obtained from human plasma is not a true protein. Serum-derived products cannot be applied as elements in media purporting to be chemically defined, as human serum albumin specifications regularly allow for up to 5% of non-albumin proteins to exist in the media. As a result, recombinant human albumin must be applied to accomplish this increased range of authority and security measures. Similar to the case of serum vs serum-derived albumin, in some examples, it has been found that a consequence of exchanging recombinant human albumin for human serum albumin is sluggish growth. This suggests that the serum-derived albumin can sometimes bestow ‘pixie dust’ on the media [2,3]. However, the opposite has also been discovered when the increased recombinant albumin purity enhances the cell culture performance . The specific function of albumin in stem cell culture is unknown . A conveyer and pool/sink for metals and other valuable molecular beings, a source of nutrients, a pH shield, a forager of toxins and reactive oxygen radicals, a surface cover to reduce direct interaction and an ‘insulator’ in media due to its even diffusion throughout solutions are all biological properties that have been credited to albumin. It is more likely that the exact stem cell and culture circumstances control which qualities of albumin are utilized and to what extent they are necessary. The exact operation of albumin in stem cell cultures may be a combination of all the qualities detailed above. The multiplicity of purposes in albumin may be a testament to why it is often successfully used as a base protein to add to a medium, and why its use is wide-ranging, not only in stem cell culture, but in biology as a whole. Technical necessities, cost and regulatory obedience are the three most referenced factors which are considered when choosing an albumin source to use in stem cell culture with a commercial endpoint. In the context of technical necessities, the albumin product used should support the beneficial growth of undifferentiated stem cells in a vigorous and reproducible fashion as detailed above. For technical necessities, there is exclusively no predilection for any of the sources of albumin. However, sources which greatly vary from batch to batch will be demanding to manage in a GMP setting. Where a decision must be made between marginally decreased production but reproducible growth, and an increased yield but a higher diversity in growth, the first option would be the most advantageous. Cost and regulatory obedience as the two other considerations display a roughly opposing relationship as detailed in Figure 1. 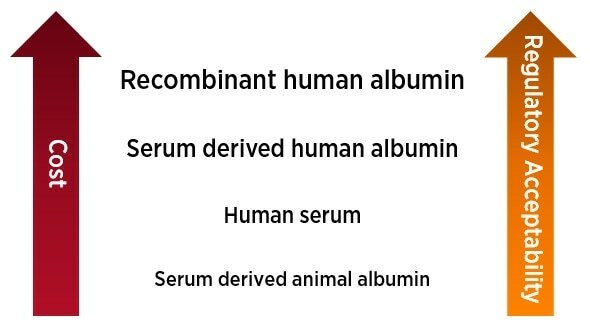 When considering the cost of albumin, the price advances from human serum, through to serum-derived animal albumin and serum-derived human albumin, to recombinant human albumin. When considering the prices of the various forms of albumin, regulatory obedience contrasts the order detailed above, where the most favorable media to the regulators are human sources, and serum-derived animal albumin, while the most cost effective, is deemed as unacceptable for use in commercial settings. In recent years, recombinant human albumin has arrived in the field of stem cell cultivation. The utilization of recombinant human albumin allows the culture media to be clearer and well governed. It does not use animals, and is a GMP raw material of high uniformity and clarity. Recombinant human albumin allows for a higher cell growth reproducibility, and is also preferred by the regulatory authorities as information that is comprehensive and of a high caliber is available for all their constituents. An important step for commercial stem cell therapies is cryopreservation because it reduces the demand for a continuous process which makes it more flexible . It is usually beneficial to have cryopreservation steps at one or two positions at least in the process following on to the differentiated stem cell therapy dose. The initial position is somewhere upstream, frequently as near to the yield or generation of the stem cells as is possible. The position after this is as far downstream in the process as possible, preferably following the harvest of the differentiated stem cell therapy dose. The first level of cryopreservation possibly allows for economy of scale, as several batches can be produced either simultaneously or in combination according to the quality of the therapy. The second step in cryopreservation provides versatility in the dispensing and distributing of the therapy. Either of these outcomes are very favorable to have if a product that is successfully commercial is to be developed. It has been shown that recombinant albumin is valuable for the longevity of stem cells under cryopreservation, even more than plasma-derived albumin. Stem cells are usually taken from their growth medium in cryopreservation, which promotes their biological needs for growth or otherwise, and are then put into a cryopreserving medium. Usually, this medium will have no small molecular nutrients, and instead buffers and salts, to uphold pH and isotonic conditions, and varied cryopreservation agents like DMSO and albumin. When the stem cells are formulated they are swiftly frozen. Once thawed, they can be returned to the growth medium for further development, or to a last formulation solution where they can be administered or processed further. The advantage of albumin, when used in cryopreservation, is most likely because of a combination of its characteristics, such as its ability to coat surfaces, its buffering ability and its capability to monitor entities in solution such as functions that assist the stem cells in coping with media change and phase transition during cryopreservation. However, the purity and origin of albumin can also play an important part, as it has been found that yeast-derived recombinant albumin, when used in cryopreservation, can stop mesenchymal stem cells from developing into late state apoptosis compared to plasma-derived albumin. This basically means there is a higher viability once the stem cells have been thawed for stem cells with recombinant human albumin as opposed to human serum albumin. Implications similar to those detailed in Figure 1 are also important to consider for the albumin source in cryopreservation use. The fundamental consideration will be the technical requirements. However, the price of goods will be less important in this context, as the amount needed in cryopreservation is particularly lower than what is needed for cell culture. It is highly important that the formulation employed for stem cell products can deliver functional therapy with repeatable results. Commonly, the stem cell therapy will be created straight after their thawing or generation. Once this has been done, many lengthy release assays must have favorable outcomes before administering to the patient. As such, the more time that the stem cells can be kept at a steady state at the point of formulation, the more wide-reaching and multi-purpose the therapy will be. An example to loosely follow is that a stability of one day will permit onsite administration, stability of two days will enable nationwide distribution, and a stability of three days will allow for use worldwide. Where the stem cell formulation has been primed in a controlled medium, a smoother release of the therapy is often the outcome because the analysis can concentrate on the stem cell therapy itself rather than possible results and pollutants from the medium. Moreover, the controlled nature of the formulation should lessen variation in the background of biological assays. It is worth noting that it is not enough to only use controlled media in the generation of the final formulation due to carry over within the steps of the process. If the user would like a controlled final formulation, this needs to be implemented into the process upstream with enough time to make sure that sufficient exchanges and dilutions have occurred to moderate any risks from uncontrolled substances. Therefore, controlled materials such as recombinant human albumin, should be implemented with plenty of time before the final formulation is created. The multitude of abilities that albumin contains detailed above are likely to need various amounts of albumin to be successful. It is beneficial to try a couple of different concentrations of albumin, including a high and a low concentration, in order to generally cover its various biological characteristics experimentally. Exactly what high and low means will vary according to factors related to the cell, for example, the type, concentration, phase, and the particular step of the production process. Most likely, it is favorable to begin with the high concentration, which is in the order of 2-5% of albumin, and the lower concentration being around ten times lower. The albumin concentration can then be further supported by more experimentation if positive outcomes are seen. Albumedix supplies recombinant human albumin in an easy-to-use liquid form where the albumin is at a concentration of 10% or more according to the product. Due to the large concentration of the albumin, a plain addition or dilution of the liquid albumin is often viable and plainly realized in formulation studies, and also in large scale production. The dedicated albumin scientists on hand at Albumedix can help if there are further questions around using recombinant human albumin products from Albumedix, or to guide and support a user on how to best utilize this product. Fanali G., di Masi A., Trezza V., Marino M., Fasano M., Ascenzi P.; Human Serum Albumin: From Bench to Bedside. Mol Aspects Med (2012) 33 209-290. Horváthy, DB., Simon M., Schwarz, CM., Masteling M., Vácz G., Hornyák, I., Lacza, Z.; Serum Albumin as a Local Therapeutic Agent in Cell Therapy and Tissue Engineering. Biofactors (2016) doi: 10.1002/biof.1337. Garcia-Gonzalo, FR., Belmonte, JCI. ; Albumin-Associated Lipids Regulate Human Embryonic Stem Cell Self-Renewal. PLoS ONE (2008) 3 e1384. Morbeck, ED., Paczkowski M., Fredriksson, JR., Kirsher, RL., Hoff, HS., Baumann, NA., Moyer, T., Matern, D.; Composition of Protein Supplement used for Human Embryo Culture. J Assist Reprod Genet (2014) 31 1703-1711. Francis GL. ; Albumin and Mammalian Cell Culture: Implications for Biotechnology Applications. Cytotechnology (2010) 62 1-16. Hunt, CJ. ; Cryopreservation of Human Stem Cells for Clinical Application: A Review. Transfus Med Hemother (2011) 38 107-123.